All service functions from Badukworld has introduced an advanced artificial intelligence. Artificial intelligence helps you enjoy games at the comfort atmosphere and best convenience. intelligence interprets the different language on greetings and some necessary playing words. Double click an ID from waiting list to play a game and an ID from playing list to watch a game. And game requests are delivered to you even while you are watching games. Press PASS or FINISH button when the game is done. And click on all dead stones on board. Effective territories are displayed with X marks. Remove whole dead stones referring X marks. Please right click to erase a false X mark. Press RESET button when an error exists in territories or dead stones. Press PLAY button to resume the game playing so that the game is not fully done. Press DECIDE button when removing dead stones are done, you will get the win/loss. Press QUIET, WARN, KICKOUT, Don't DISTURB or HELP when your opponent is impolite. Game continues when your computer restarts or Internet recovers from failure within 5 minutes. CONXION test is recommended when your opponent has no response for a long time. Promotion in Dan is made at point +10, promotion in Kyu at point +7. If you use Microsoft Windows in your computer, we recommend you to install the Badukworld Icon. The Icon runs quick-n-fast and doesn't need even java download. Play with web browser--no software to download. Board and stones are the most beautiful in the world. 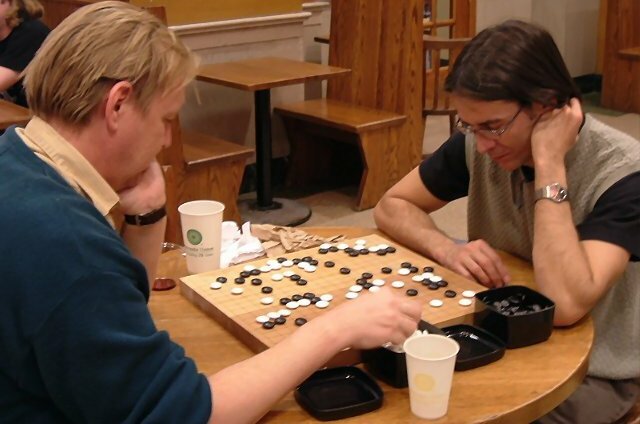 42.5x45.5cm standard Go board is adopted. Non-glaring stones reduce your eye's fatigue. High-end clicking protects your wrist articulation.